Governor Hickenlooper joined the CJI Board and 650 guests at the Judicial Excellence for Colorado Dinner. Southern charm and western hospitality joined to celebrate a half century of fair and impartial courts at the Colorado Judicial Institute’s 14th annual Judicial Excellence for Colorado awards dinner at the Marriot City Center Oct. 18. Sue Bell Cobb, the first woman to be elected as chief justice of the Alabama Supreme Court, delighted the crowd of people with folksy tales of campaign meetings with voters and cautionary warnings of the stress that partisan campaigns – which require would-be judges to raise millions of dollars in campaign funds – place on the need to preserve both the appearance and reality of fair and impartial courts. Colorado Gov. 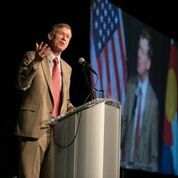 John Hickenlooper -- who has himself appointed 129 judges, including three to the Colorado Supreme Court under the state’s merit selection system -- said the state’s reputation for fair and excellent courts is vital to its economic development efforts. “The rule of law is crucial if we are to be perceived as having a healthy business climate. Our courts must be both fair and excellent. I believe in democracy but I don’t believe in electing judges,” the governor said to widespread applause. The evening featured a film quoting several old-time Colorado lawyers who practiced before the state adopted the merit system of judicial appointments, then known as the “Missouri plan,” in a 1966 constitutional amendment. They noted the indignity – to judges and litigants alike -- of being solicited for campaign contributions by court clerks and sometimes directly by the very judges before whom they were trying their cases. Former CJI chairman Bob Miller, a legal veteran who practiced before the 1966 reform, vividly recalled the embarrassment of being asked by clients whether he had contributed to the trial judges campaign – and whether the client could expect fair treatment if he had not. “I was mortified,” Judge Cobb said. “And while I was proud of the work I did for the next four and a half years, I never quite got over the feeling of being trapped inside a system whose very structure left me feeling disgusted. I’ve never made a decision in a case in which I sided with a party because of a campaign donation. But those of us seeking judicial office sometimes find ourselves doing things that feel awfully unsavory. “In Alabama, would-be judges are allowed to ask for money directly. We can make calls not just to the usual friends and family, but to lawyers who have appeared before us, lawyers who are likely to appear before us, and officials with companies who may very well have interests before the court. And I did.” Cobb said. . Unlike such cash-drenched elections, when a vacancy on the bench occurs in Colorado, non-partisan commissions review potential replacements and nominate two or three candidates to the governor. Once appointed, a judge serves at least two years before facing voters in a non-partisan retention election. If voters decide not to give the judge a full term, the merit process starts over again. If retained, the judge serves a term of ten years on the Supreme Court, eight years on the Court of Appeals, six years for the District Court and four years for county courts. At the end of the term, the judge can stand for retention to another term, but may not serve in office past his or her 72nd birthday. The merit selection system is backed by high standards for judicial conduct and performance. An independent commission on judicial discipline reviews complaints against judges and may institute disciplinary or removal proceedings for violation of the Code of Judicial Conduct. This commission also may retire a judge for disability of a permanent character interfering with performance of duties. Besides honoring judicial excellence, the annual dinner helps raise funds to support education and training for judges and court personnel. CJI’s 2016 awards recognized three jurists for outstanding work, including District Court Chief Judge Michael O’Hara of the 14th Judicial District, Denver County Court Presiding Judge John Marcucci and Boulder County Magistrate Carolyn McLean. Bob Ewegen, who retired from The Denver Post in 2008 after more than 36 years atthe paper, is CJI Journalist in residence and a member of the CJI Board. He is director of communications and research at the Ewegen Law firm headed by his daughter, Misty Ewegen.